I hope that all of my American friends had a beautiful Thanksgiving. I made a Thanksgiving feast for my family but was so busy and flustered I forgot to take photos of the table and the food. I am so angry because I found some great recipes from the November issue of BHG ("A Thanksgiving Celebration with Friends"). The pictures below come from the BHG website and if you click on the link you will go directly to the recipe. Along with the turkey I made the Chardonnay Glazed Carrots. The hint of Cinnamon was truly delightful! 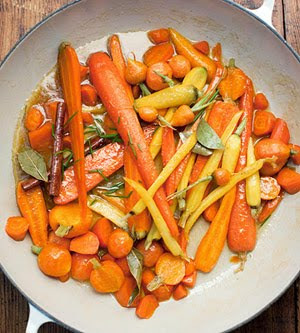 I used Maggie Beer's Verjuice in this recipe. This was unbelievable! I have never had marshmallows with sweet potatoes before...what a taste sensation! I also made some Brussels sprouts with bacon and, of course, lots of green beans. My mum made mashed potatoes and my Mother-in-law made stuffing balls (I ran out of steam and just couldn't make stuffing/dressing...maybe next year). This tart was so delicious and I really loved the addition of the cranberries. Before we ate we all gave thanks for something (Big Al gave thanks for chocolate...) and then the feasting began! I was so happy with how everything turned out and these recipes really were really delicious. But now that Thanksgiving is over I still feel like I need to bake-I am on a roll in my new kitchen! I think I should try to broaden my baking horizons though, so I think I am going to make some cookies!! Some of my regular readers might already know that I never usually have time to bake and cook at this time of year because I would normally be marking papers, writing report cards and going to end of year functions for my school and for my kid's school. Since I am a SAHM now, I am going to bake and bake and bake!!! 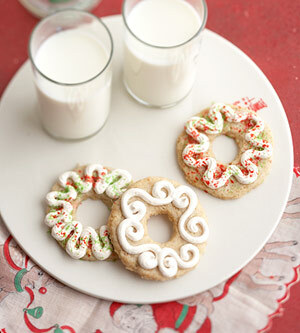 Here are some cookie recipes that I found on BHG.com and they look quite manageable. Thank you Better Homes and Gardens- I love your magazine and website! If you click on the name of the cookie you will go straight to the recipe. These look simple, elegant and very cute! How cute are these? Move over Gingerbread boys! These look so festive and Christmassy don't they! 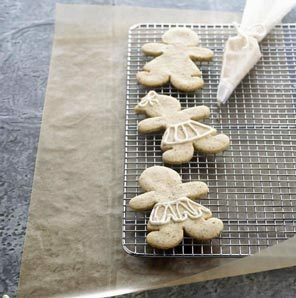 I can't wait to start baking these little cuties! Before I get ready for my glass of Friday night wine I just want to thank my beautiful friend Nat from Girls are made of sugar and spice. She has given me 2 lovely awards! Thank you my friend! Keep cooking up a storm and posting your delicious recipes! I would like to pass these awards on to 2 new blogging friends. These beautiful people have great blogs and I love going to visit them. I hope that the beautiful Jill from Woodsy Ivy will accept the Happy Mama award because she is such a wonderful Mum who is truly devoted to her family and that Tammy from A Doctor in the House will accept the Honest Scrap award. Tammy's blog is full of great pictures of her beautiful home and family. Please go and visit them if you haven't already met them. Coincidentally, as I am acknowledging my blogging friends, Dr Weil has also posted some very interesting information today about friends. Dr Weil has highlighted the fact that studies show that social connections can result in good health and even prolonged survival among patients with very serious diseases. Dr Weil refers to one study of 75 medical students which found that those who were lonely had more sluggish natural killer cells than students who were social. Dr Weil also suggests that people who have companion animals have less illness than people who do not. Thank goodness for friends! So, thank you friends for coming to spend 5 minutes with me today. I hope that you have a safe and happy weekend and if you need some recipes for any left-over turkey click here and you will find some great ideas at Epicurious.com. Love your pictures and those cookies; my grandchildren are coming next weekend and they want to make cookies...won't that be fun Congratulations; lovely award. Thoses cookies look so good! I am going to look up the diabetic living on-line. My father in law is diabetic and cookies made just for him would make his Christmas! We are lucky to have made so many great friendships through our computers!! Thank you Natasha for the kind compliments! I'm so new to blogging, I hardly understand the award thing. But I humbly accept it, whatever that means! lol We had a wonderful Thanksgiving. Glad you did too! I'm with the thanking elastic waistbands quote!!! Your table was every bit as gorgeous as the magazine photos I am sure!! Yum - think I'm going to have my Friday night wine now! You made an incredible feast, Natasha!! Good for you. Everything sounded yummy, especially your pastry. After I have spent awhile cooking, I crave to bake, just to do something different. It sounds like you have a lovely day planned and your enthusiasm is catchy!! All of the cookies look delicious. The chocolate Krinkles caught my eye. Enjoy the weekend. I wanted to tell you thank you so much for your voting too. You're a great blog friend and I appreciate your help! You sound like me...I had a bunch of people over the Sunday before Thanksgiving and I was so upset I didn't get pictures of anything besides the desserts because there was just too much going on (and I was frazzled, too). 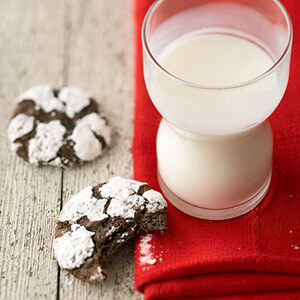 Thanks for the links to the cookie recipes. I'm going to check them out. Oh my goodness, you are such a doll! Thank you so much, girlie! You've made my entire week! Your food pics look so delicious! I made sweet potatoes that are similar to the pic you show and they were so yummy! 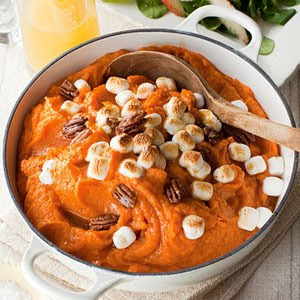 Sweet potatoes and marshmallows are my favorite! Glad you had a good Thanksgiving. I'm with you--I bailed on the idea of making stuffing for my turkey. I ran out of steam. Thank you again sooooo much! You are a sweetheart! 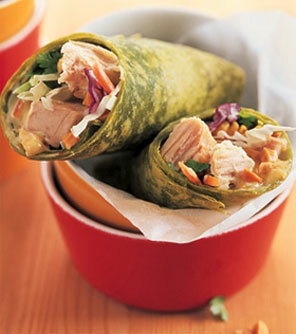 Hi Natasha thanks for sharing all the wonderful recipes and beautiful pictures. 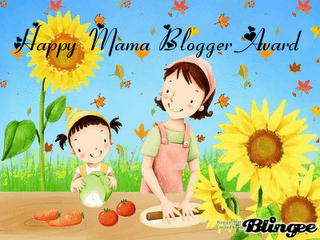 Congrats on the Happy Mama Award and you certainly deserved it. Thanks for following me and I'm so glad to be your friend. G'day ~ Would you share that chocolate cherry shortbread recipe please? We are having a HUGE GIVEAWAY, come enter. All those cookies look SOOOO good. Let us know how they turn out and which ones are the best. Oh my goodness, these cookies look AMAZING!! Thank you so much for sharing. 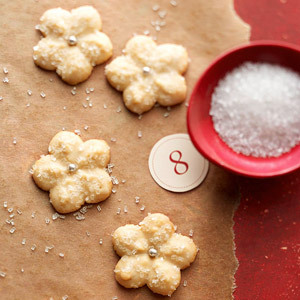 My girl's would love to have a baking feast and create some of these beauties. YUM!! Thanks for commenting on my blog! Hope you had a great Thanksgiving! For Pete's sake. It's late and now you've got me thinking about nothing but eating! Those cookies look so yummy! As I am just enjoying getting to know you it was fun to hear you were a teacher & now a SAHM...I was a teacher before I had my first & now am enjoying staying home too...I completely understand that road! :) I can't wait to see pictures of all the goodies you bake up~your Thanksgiving Feast sounded heavenly!!! 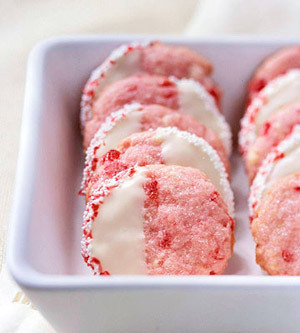 And I do think I might have to whip up some of those Cherry shortbread cookies! Wow! Those were soooo pretty! Thanks for the idea! Better Homes? I better look there! Happy Baking! Ha ha ha, I wish I had elastic waistbands! My only option is to be careful! congrats on the awards and wow great cookies great for this time of year but its summer for you in Australia now is it? Thanks for following my blogs and for your comments. Your blog looks yummie! Reason to be your 100 follower. All of those cookies are stunning! Such wonderful creations! Bonjour! 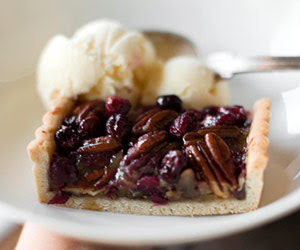 Your Thanksgiving dinner looke delicious - especially the Pecan Cranberry Tart! 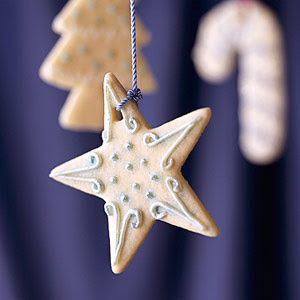 I'm off to the kitchen now after seeing all those wonderful cookies! Oooo... looks so tasty! 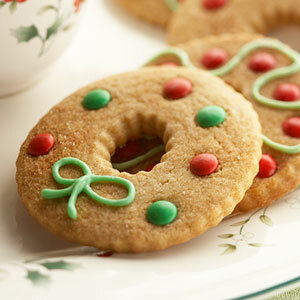 I love the Christmas wreath cookies. Too cute. The pecan dessert looks worth a try too! I don't really like to cook, but I love to bake! I made some butterscotch pumpkin bread for Thanksgiving that was a huge hit! I jumped over here from Melinda's blog, and I'll be back! I like your idea of taking 5 minutes for you -- Moms need that! I'm launching a new blog with the goal of encouraging and inspiring moms. Thanks for coming to visit LLG and I hope to see you again soon! Please let me know about your new blog as soon as you launch it-it sounds like my kind of blog! I'm with you - there is nothing better than stretch pants on Thanksgiving day!! I hate that you forgot to photograph your special dishes. I do that a lot and there is just no going back is there? I know that they were delicious and pretty! I am delighted that you came over. What lovely looking cookies! And I enjoyed your Thanksgiving dishes- sweet potatoes and marshmellows are so yummy; and it's a good thing to be thankful for chocolate! Thanks for stoping by my blog! Hop on over to my kitchen blog and you must look at and bake the white chocolate cranberry biscotti! You simply MUST! The cookies are beautiful. I thought I recognized one of them from BHG magazine, then I read closer. Love your blog, just darling. Thanks for the tip Entertaining Mom- I will head over now! Thanks also for the visit Cristie and for leaving such a lovely comment. I hope to see you again soon.